While I am not being the Bearded Realtor with The Group Real Estate in Idaho Falls, I am trying to give back. I really enjoy giving my time to volunteer work and helping when and where I can. 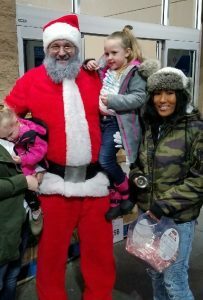 I recently had the experience of playing Santa Clause for the Salvation Army, ringing the bell in front of Sam’s Club in Idaho Falls. I dressed up as Santa Clause and the costume was perfect. I have a pretty good beard but the problem is that I am not nearly gray enough to pull off the jolly old fella. So I had to spray paint my beard white. It turned out okay but wow did I hate the smell of the paint. I know that most people will probably already know who Santa Clause is but I wanted to share some of the story as to why he is so popular in our western culture. Santa Claus, has many names so of which are known as Saint Nicholas, Saint Nick, Kris Kringle, Father Christmas, or simply Santa he is a legendary figure originating in Western Christian culture who is said to bring gifts to the homes of well-behaved (“good” or “nice”) children on Christmas Eve (24 December) and the early morning hours of Christmas Day (25 December). 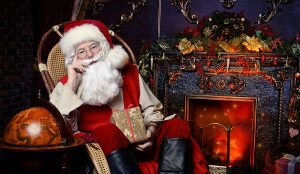 The modern Santa Claus grew out of traditions surrounding the historical Saint Nicholas, a fourth-century Greek bishop and gift-giver of Myra, the British figure of Father Christmas and the Dutch figure of Sinterklass (himself also based on Saint Nicholas). Some maintain Santa Claus also absorbed elements of the Germanic god Wodan, who was associated with the pagan midwinter event of Yule and led the wild hunt, a ghostly procession through the sky. Santa Claus is generally depicted as a portly, joyous, white-bearded man mine was not white so hence the paint, sometimes with glasses, wearing a red coat with white fur collar and cuffs, white-fur-cuffed red trousers, and black leather belt and boots and who carries a bag full of gifts for children. This image became popular in the United States and Canada in the 19th century due to the significant influence of the 1823 poem “a visit from St. Nicholas” and of caricaturist and political cartoonist Thomas Nast This image has been maintained and reinforced through song, radio, television, children’s books, films, and advertising. Santa Claus is said to make lists of children throughout the world, categorizing them according to their behavior (“good” and “bad”, or “naughty” and “nice”) and to deliver presents, including toys, and candy to all of the well-behaved children in the world, and coal to all the misbehaved children, on the single night of Christmas Eve. He accomplishes this feat with the aid of his elves, who make the toys in his workshop at the North Pole, and his flying reindeer (Nicole in this case), who pull his sleigh. He is commonly portrayed as living at the North Pole and saying “ho ho ho” often. I have never done this before and if I am going to be honest never really wanted to be the guy out asking for money. Truth be told I have walked past the bell ringers for years bowing my head and walking awkwardly past. Being on the other side of the bell, I now know that people feel awkward for a million different reasons. Be it from not having any change to put in the bucket to not wanting to. I was a little nervous to go and do this but I quickly found my groove as Santa. The spirit of giving is a very real thing. I watched as people were walking in and out of the store and how they looked at me differently as Santa. It did not matter the age young and old I almost always got a smile or at least a grin. I was only signed up to be there for an hour and I realized about twenty minutes in that if I could get people to smile before they got up to the bucket then all of that awkward tension went away. They way I was doing that was to spot them from a distance as they were walking from the parking lot to the entrance and give a big bellowing HO HO HO MERRY CHRISTMAS, while waving at them specifically. As Santa I was wearing white gloves that caused a contrast against the darkness of the night, so when I waved at them they could see it from a long distance. I would say that ninety percent of the time this caused them to at least smile and sometimes give a “merry Christmas to you” back. This was directed at the older generation of people. I would say from twenty years old and up this was the case. I had a friend that was doing this with me. Her name is Nicole. Our plan was to have her dress up as a reindeer to be Santa’s helper but due to the holiday delay in shipping her costume did not show up in time. But she still came and held the candy cane bucket to give to the younger kids and everyone who wanted one. It is really kind of crazy how people will hand you their babies to take a picture. Most young kids will have a stranger danger moment and start to cry but if I could just take a picture with them while their parents were still holding them it seemed to go much better. I guess all in all my point is to show people that its really not about the money that goes into the bucket. Don’t get me wrong the money goes to a great cause and is worth doing. But I really enjoyed getting people to smile more than anything. The spirit of Christmas and who Santa is in my opinion is to bring happiness. If I had to relate this to the Bible and what I think Christmas is all about is Love. Loving people. I really love my job because, I love people.